The last two weekends were real busy for Lacey, with the Snow Summit AM Cup #3 on Aug. 14 and the final Rim Nordic race on Aug. 21. The first AM Cup Lacey raced in she did both the Short and Long Course races. This time she just wanted to race in the Long course. It was an 8.6 mile loop with 1295 ft. of elevation gain. This time I let her do the race on her own (I think she goes a little faster without me telling her what to do) and I entered the Super D. On my first practice run, I found a spot that looked like a good place to wait a get a picture of her racing. After waiting a few minutes, here came little Troy with his Dad Jim right with him. Man, he's a little powerhouse! Not long after, Lacey came around the corner just behind a few of the Sport class racers. She was MOVING! I missed getting her picture there, so I had to hurry up and catch her to get a shot. She was pretty giddy, saying that, "I was flying down the fire roads!" SWEET! She ended up finishing in 1 hr. 29 mins., and taking first in her age group, since once again, no other girls raced. But she was happy to see that she did beat a couple of the boys entered. The Rim Nordic race was the final one there for this season. 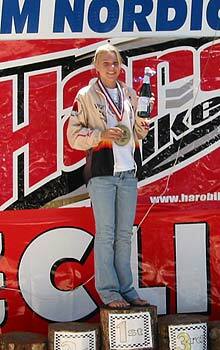 She was the only girl entered there also, so she took first in her age group for the day, and the series. She got a surprise visit from Monique, who was there with Ron, cheering him on for his race. The course was a 7.5 mile loop, with 1097 ft elevation gain. To say that the course shorter here than Snow Summit, wouldn't be telling the whole story. 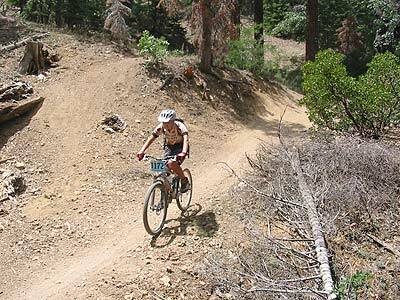 The fun technical single track that is used for these races, is tougher and more FUN than the fireroads used at Snow Summit. Lacey finished her loop in 1 hr 35 mins. Not bad for 12 going on 13. There is on more AM Cup race to go, and then one race in Fontana in October, then her first season as a racer will be finished. I asked her if she wanted to give the Counting Coup another try. "Sure," she says. Oh man, I need to start riding more.